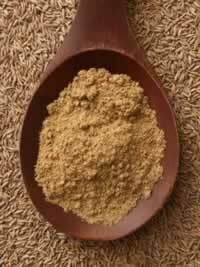 Preparation Methods & Dosage :Cumin is a major component of curry and chili powders, the seeds may be toasted or used fresh, and added to teas. Cumin is used worldwide in cooking especially in the Middle East, India, and Mexico where it was introduced by the Spanish. It's popularity in the US rose with the increased interest in Mexican food and other ethnic dishes. Cumin is aromatic, containing up to 4 percent essential oil, warm, spicy and slightly sweet. Ayurvedic Medicine A decoction of cumin, jaljari can be taken as a cooling drink in the summer. It is considered a good antidote to pungent foods like tomatoes and chilies, and is often included in recipes that are heavy on pungent tastes. 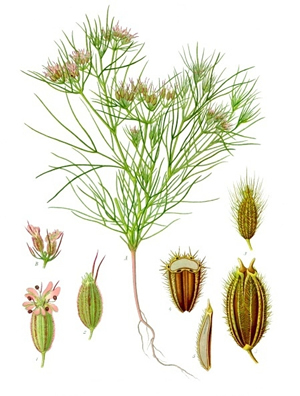 Related Species Do not confuse cumin with sweet cumin, which is a common name for anise (Pimpinella anisum). Black cumin, or black seed oil (Nigella sativa) is not botanically related to cumin.